Liquid water can exist in two different forms – at least at very low temperatures. This is the conclusion drawn from X-Ray measurements carried out by an international team of researchers headed by Stockholm University. The experiments were performed at DESY in Hamburg and at the Argonne National Laboratory in the US and are now reported in the Proceedings of the National Academy of Sciences (PNAS). Pictured is an artist’s impression of the two forms of ultra-viscous liquid water with different density. On the background is depicted the x-ray speckle pattern taken from actual data of high-density amorphous ice, which is produced by pressurizing water at very low temperatures. Image courtesy of Mattias Karlén. The scientific team led by Anders Nilsson had been studying so-called amorphous ice. This glass-like form of frozen water has been known for decades. It does not occur in everyday life and does not occur naturally on earth; however, most water ice in the universe actually exists in this amorphous form. Instead of forming a solid crystal – as in an ice cube taken from the freezer – the amorphous ice consists of disordered arrangement of water molecules, more akin to the internal structure of liquid water. Amorphous ice can be produced, by cooling liquid water so rapidly that the molecules do not have enough time to form a crystal lattice, by vapor deposition as it also happens in outer space as well as by pressure amorphization in the lab, as done in the present study. “The new remarkable property is that we find that water can exist as two different liquids at low temperatures where ice crystallization is slow”, says Anders Nilsson, professor in Chemical Physics at Stockholm University. 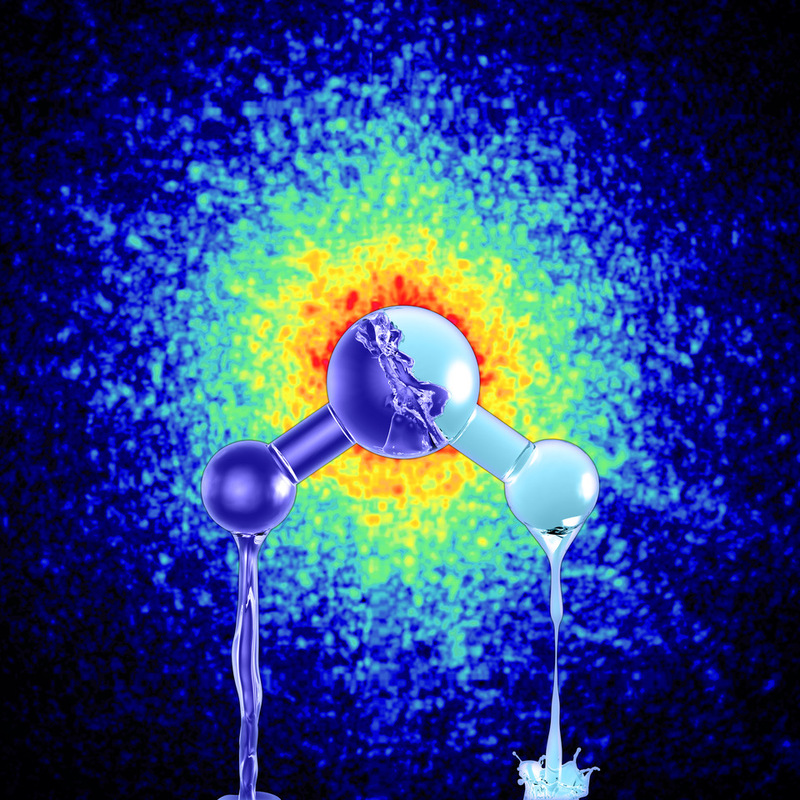 The breakthrough in the understanding of water has been possible through a combination of studies using X-rays at Argonne National Laboratory near Chicago, where the two different static structures were characterized in high resolution and at the large X-ray laboratory DESY in Hamburg where the dynamics could be investigated and demonstrated that the two states indeed both were liquid phases. This demonstrates the existence of the two suspected varieties of liquid water – at least at very low temperatures. The extremely low-temperature water is so viscous that the two liquid phases are only transformed into each other and only mix very slowly, allowing this process to be measured. “It is very exciting to be able to use X-rays to determine the relative positions between the molecules at different times”, says Fivos Perakis who was one of the two principal authors of the study, along with Katrin Amann-Winkel. “We have in particular been able to follow the transformation of the sample at low temperatures between the two phases and demonstrated that there is diffusion as is typical for liquids”. “I have studied amorphous ices for a long time with the goal to determine whether they can be considered a glassy state representing a frozen liquid”, says Katrin Amann-Winkel, researcher in Chemical Physics at Stockholm University. “It is a dream come true to follow in such detail how a glassy state of water transforms into a viscous liquid which almost immediately transforms to a different, even more viscous, liquid of much lower density”. “The possibility to make new discoveries in water is totally fascinating and a great inspiration for my further studies”, says Daniel Mariedahl, PhD student in Chemical Physics at Stockholm University. “It is particularly exciting that the new information has been provided by X-rays since the pioneer of X-ray radiation, Wolfgang Röntgen, himself speculated that water can exist in two different forms and that the interplay between them could give rise to its strange properties”. These new results not only create an overall understanding of water at different temperatures and pressures, but also how water is affected by salts and biomolecules important for life. In addition, the increased understanding of water can lead to new insights on how to purify and desalinate water in the future. This will be one of the main challenges to humanity in view of the global climate change. These studies were led by Stockholm University and involve a collaboration including the KTH Royal Institute of Technology in Stockholm, DESY in Hamburg, University of Innsbruck and Argonne National Laboratory in USA.